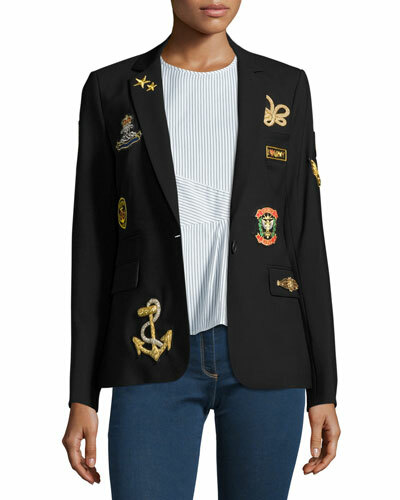 More Details Escada One-Button Welt-Pockets Velvet Jacket w/ Satin Notch Lapels Details EXCLUSIVELY AT NEIMAN MARCUS Escada velvet jacket with satin trim. Notched lapels; one-button front. Long sleeves. Side welt pockets. Tailored fit. Back hem pleat. Silk. Imported of Italian materials. 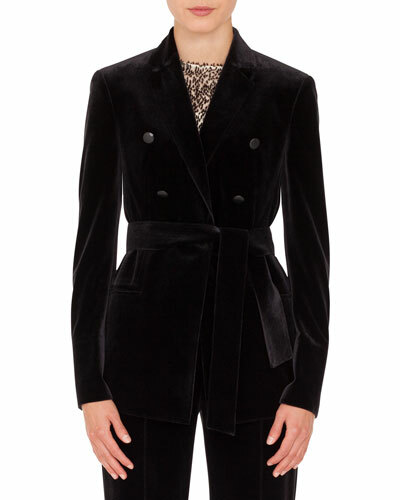 Escada One-Button Welt-Pockets Velvet Jacket w/ Satin Notch Lapels Details EXCLUSIVELY AT NEIMAN MARCUS Escada velvet jacket with satin trim. Notched lapels; one-button front. Long sleeves. Side welt pockets. Tailored fit. Back hem pleat. Silk. Imported of Italian materials. More Details TOM FORD O'Connor Base Plaid Cardigan Jacket Details TOM FORD "O'Connor" cardigan jacket in glen plaid. Notched lapel; hand-finished, double-stitched silk button hole. Two-button front with horn buttons. Front patch pockets; hand-cut chest welt pocket. Double vented back. Signature TOM FORD details like hand-rolled three-fold hang cord and exclusive blend lining. Mulberry silk/cashmere. Made in Italy. Jacket will ship with prepped sleeves and a set of buttons. 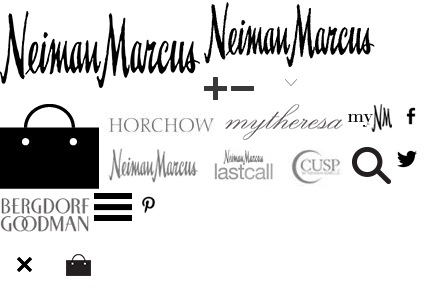 Please contact your local Neiman Marcus store for proper finishing of your garment. TOM FORD O'Connor Base Plaid Cardigan Jacket Details TOM FORD "O'Connor" cardigan jacket in glen plaid. Notched lapel; hand-finished, double-stitched silk button hole. Two-button front with horn buttons. Front patch pockets; hand-cut chest welt pocket. Double vented back. Signature TOM FORD details like hand-rolled three-fold hang cord and exclusive blend lining. Mulberry silk/cashmere. Made in Italy. Jacket will ship with prepped sleeves and a set of buttons. Please contact your local Neiman Marcus store for proper finishing of your garment. More Details TOM FORD Shelton Base Floral Velvet Dinner Jacket Details TOM FORD "Shelton" base dinner jacket in floral velvet. Peak lapel; hand-finished double-stitched silk button hole. Two-button front with hand-stitched buttons. Front besom pockets; hand-cut chest welt pocket. Center back vent. Signature Tom Ford details like hand-rolled three-fold hang cord. Tailored fit. Cotton. Made in Italy. Jacket will ship with prepped sleeves and a set of buttons. Please contact your local Neiman Marcus store for proper finishing of your garment. 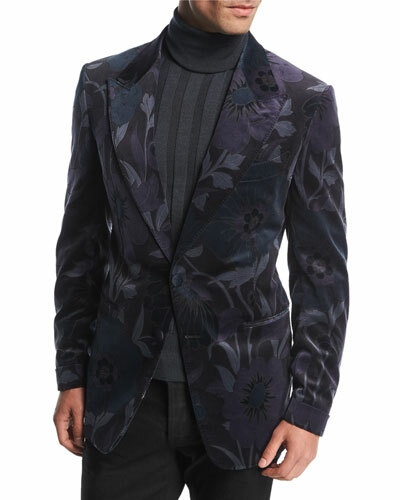 TOM FORD Shelton Base Floral Velvet Dinner Jacket Details TOM FORD "Shelton" base dinner jacket in floral velvet. Peak lapel; hand-finished double-stitched silk button hole. Two-button front with hand-stitched buttons. Front besom pockets; hand-cut chest welt pocket. Center back vent. Signature Tom Ford details like hand-rolled three-fold hang cord. Tailored fit. Cotton. Made in Italy. Jacket will ship with prepped sleeves and a set of buttons. Please contact your local Neiman Marcus store for proper finishing of your garment. 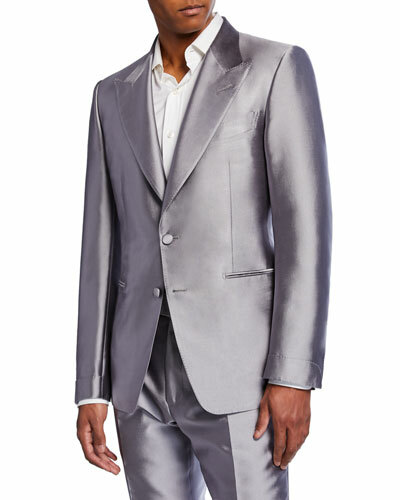 More Details TOM FORD Satin-Lapel Honeycomb-Weave Dinner Jacket Details TOM FORD dinner jacket in honeycomb jacquard. Satin shawl lapel; hand-finished, double-stitched silk button hole. Structured shoulders. Single-button front with covered horn button. Front besom pockets with satin lining; hand-cut and -stitched chest welt pocket. Center back vent. Signature TOM FORD details like hand-rolled threefold hand cord and exclusive blend lining. Mulberry silk/polyester. Made in Italy. 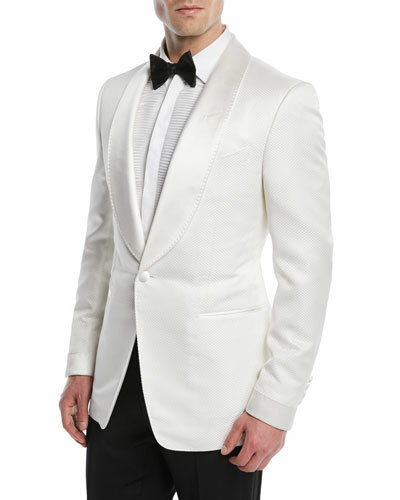 TOM FORD Satin-Lapel Honeycomb-Weave Dinner Jacket Details TOM FORD dinner jacket in honeycomb jacquard. Satin shawl lapel; hand-finished, double-stitched silk button hole. Structured shoulders. Single-button front with covered horn button. Front besom pockets with satin lining; hand-cut and -stitched chest welt pocket. Center back vent. Signature TOM FORD details like hand-rolled threefold hand cord and exclusive blend lining. Mulberry silk/polyester. Made in Italy. 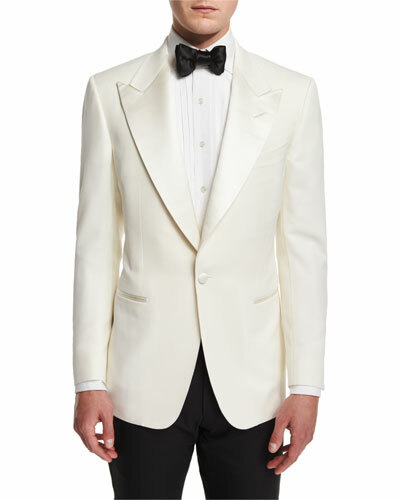 More Details TOM FORD Windsor Base Dinner Jacket, White Details TOM FORD "Windsor" base dinner jacket. Satin peak lapel; hand-finished, double-stitched silk button hole. Structured shoulders. Covered single-button front. Front besom pockets with satin lining; hand cut and stitched chest welt pocket. Double-vented back. Signature TOM FORD details like hand-rolled three-fold hand cord and exclusive blend lining. Wool. Made in Switzerland of Italian material. Jacket will ship with prepped sleeves and a set of buttons. Please contact your local Neiman Marcus store for proper finishing of your garment. 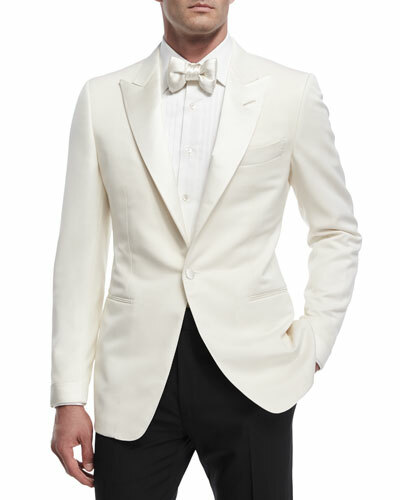 TOM FORD Windsor Base Dinner Jacket, White Details TOM FORD "Windsor" base dinner jacket. Satin peak lapel; hand-finished, double-stitched silk button hole. Structured shoulders. Covered single-button front. Front besom pockets with satin lining; hand cut and stitched chest welt pocket. Double-vented back. Signature TOM FORD details like hand-rolled three-fold hand cord and exclusive blend lining. Wool. Made in Switzerland of Italian material. Jacket will ship with prepped sleeves and a set of buttons. Please contact your local Neiman Marcus store for proper finishing of your garment. 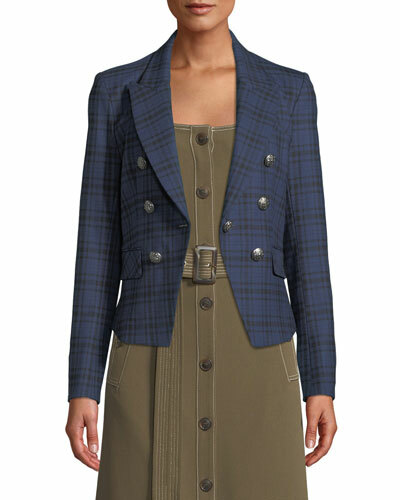 More Details Veronica Beard Kenton Plaid Single-Button Jacket Details EXCLUSIVELY AT NEIMAN MARCUS Veronica Beard "Kenton" plaid jacket with silver crest buttons. Peak lapels; single-button front. Double-breasted button details. Long sleeves; button cuffs. Chest welt pocket. Side flap pockets. Fitted silhouette. Arched back hem. Polyester/virgin wool/lyocell. Made in USA of imported material. Veronica Beard Kenton Plaid Single-Button Jacket Details EXCLUSIVELY AT NEIMAN MARCUS Veronica Beard "Kenton" plaid jacket with silver crest buttons. Peak lapels; single-button front. Double-breasted button details. Long sleeves; button cuffs. Chest welt pocket. Side flap pockets. Fitted silhouette. Arched back hem. Polyester/virgin wool/lyocell. Made in USA of imported material. 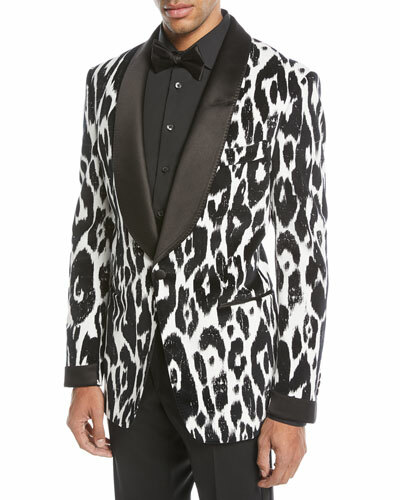 More Details TOM FORD Ikat-Print Shawl Collar Dinner Jacket Details TOM FORD dinner jacket in graphic ikat-print jacquard. Satin shawl lapel; hand-finished, double-stitched silk button hole. Structured shoulders. Single-button front with covered horn button. Front besom pockets with satin lining; hand-cut and -stitched chest welt pocket. Double-vented back. Signature TOM FORD details like hand-rolled three-fold hand cord and exclusive blend lining. Cotton. Made in Italy. TOM FORD Ikat-Print Shawl Collar Dinner Jacket Details TOM FORD dinner jacket in graphic ikat-print jacquard. Satin shawl lapel; hand-finished, double-stitched silk button hole. Structured shoulders. Single-button front with covered horn button. Front besom pockets with satin lining; hand-cut and -stitched chest welt pocket. Double-vented back. Signature TOM FORD details like hand-rolled three-fold hand cord and exclusive blend lining. Cotton. Made in Italy. More Details Theory Off-the-Shoulder Pinstripe Jacket Details EXCLUSIVELY AT NEIMAN MARCUS Theory pinstripe jacket. Off-the-shoulder neckline. Concealed double zip front closure. Long sleeves. Front welt pockets. Fitted silhouette. Nylon/polyester. Imported. 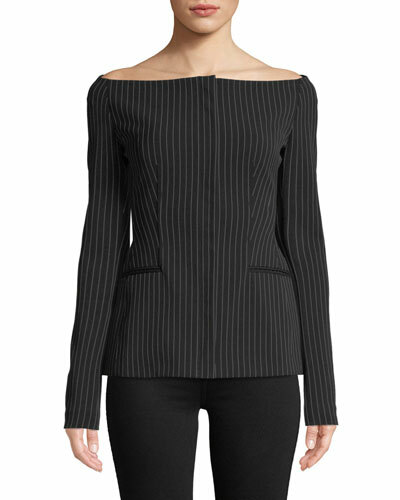 Theory Off-the-Shoulder Pinstripe Jacket Details EXCLUSIVELY AT NEIMAN MARCUS Theory pinstripe jacket. Off-the-shoulder neckline. Concealed double zip front closure. Long sleeves. Front welt pockets. Fitted silhouette. Nylon/polyester. Imported. 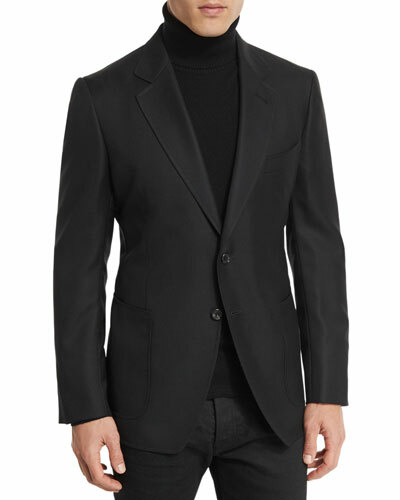 More Details TOM FORD Shelton Base Wool-Mohair Cardigan Dinner Jacket Details EXCLUSIVELY AT NEIMAN MARCUS TOM FORD "Shelton" base cardigan dinner jacket. Satin peak lapel; hand-finished double-stitched silk button hole. Single-button front with hand-stitched button. Front besom pockets; hand-cut chest welt pocket. Double-vented back. Signature Tom Ford details like hand-rolled three-fold hang cord. Tailored fit. Unlined. Wool/mohair. Made in Italy. Suit/Jacket will ship with prepped sleeves and a set of buttons. Please contact your local Neiman Marcus store for proper finishing of your garment. TOM FORD Shelton Base Wool-Mohair Cardigan Dinner Jacket Details EXCLUSIVELY AT NEIMAN MARCUS TOM FORD "Shelton" base cardigan dinner jacket. 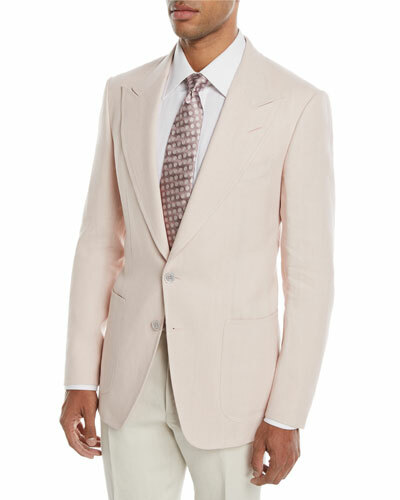 Satin peak lapel; hand-finished double-stitched silk button hole. Single-button front with hand-stitched button. Front besom pockets; hand-cut chest welt pocket. Double-vented back. Signature Tom Ford details like hand-rolled three-fold hang cord. Tailored fit. Unlined. Wool/mohair. Made in Italy. Suit/Jacket will ship with prepped sleeves and a set of buttons. Please contact your local Neiman Marcus store for proper finishing of your garment. 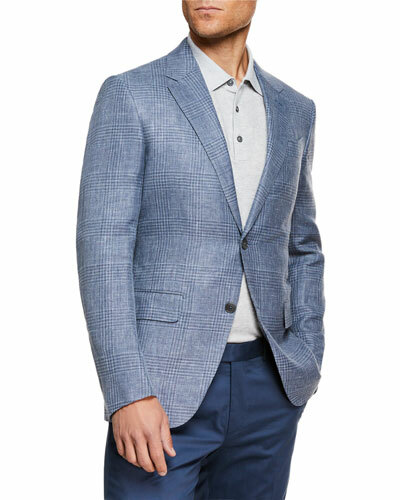 More Details Giorgio Armani Men's Solid Melange Hopsack Two-Button Jacket Details EXCLUSIVELY AT NEIMAN MARCUS Giorgio Armani sport coat in textured hopsack. Notched lapel; two-button front. Basted sleeves. Chest welt pocket; hip flap pockets. Virgin wool/cashmere. Viscose lining. Made in Italy. 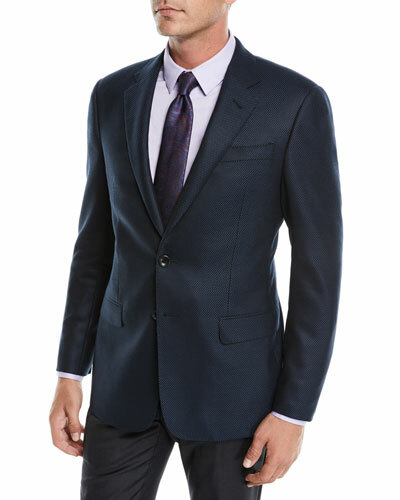 Giorgio Armani Men's Solid Melange Hopsack Two-Button Jacket Details EXCLUSIVELY AT NEIMAN MARCUS Giorgio Armani sport coat in textured hopsack. Notched lapel; two-button front. Basted sleeves. Chest welt pocket; hip flap pockets. Virgin wool/cashmere. Viscose lining. Made in Italy. 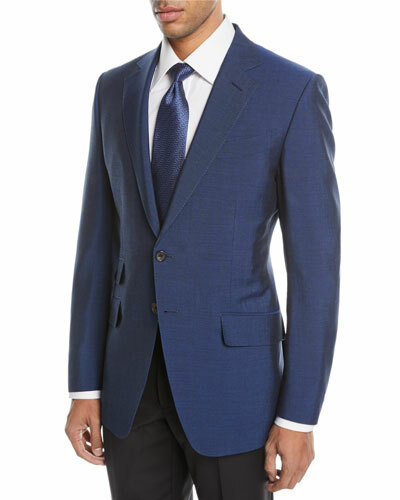 More Details Kiton Men's Cashmere Three-Button Jacket Details EXCLUSIVELY AT NEIMAN MARCUS Kiton sport coat in solid weave. Notched lapels; three-button front. Basted sleeves. Flap pockets; chest welt pocket. Darted front; trim fit. Double-vented back. Cashmere. Made in Italy. 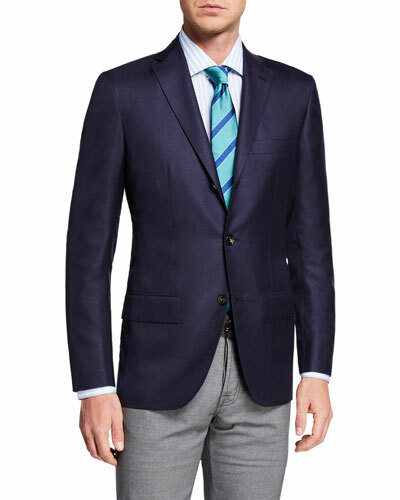 Kiton Men's Cashmere Three-Button Jacket Details EXCLUSIVELY AT NEIMAN MARCUS Kiton sport coat in solid weave. Notched lapels; three-button front. Basted sleeves. Flap pockets; chest welt pocket. Darted front; trim fit. Double-vented back. Cashmere. Made in Italy. 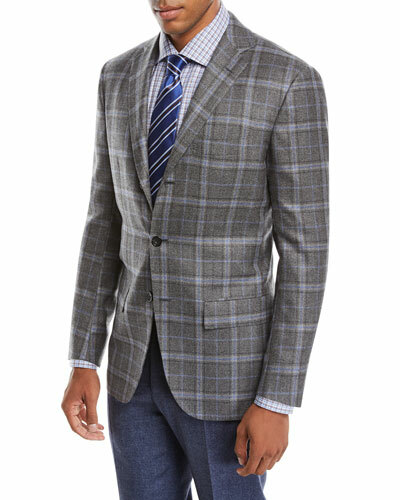 More Details Giorgio Armani Men's Plaid Wool Two-Button Jacket Details EXCLUSIVELY AT NEIMAN MARCUS Giorgio Armani sport coat in plaid. 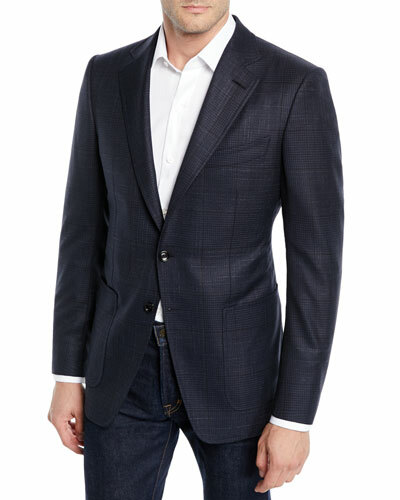 Notch lapel; two-button front. Basted sleeves. Chest welt pocket. Side flap pockets. Virgin wool; viscose lining. Made in Italy. 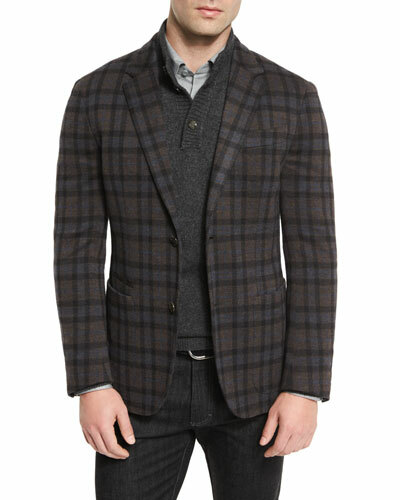 Giorgio Armani Men's Plaid Wool Two-Button Jacket Details EXCLUSIVELY AT NEIMAN MARCUS Giorgio Armani sport coat in plaid. Notch lapel; two-button front. Basted sleeves. Chest welt pocket. Side flap pockets. Virgin wool; viscose lining. Made in Italy. 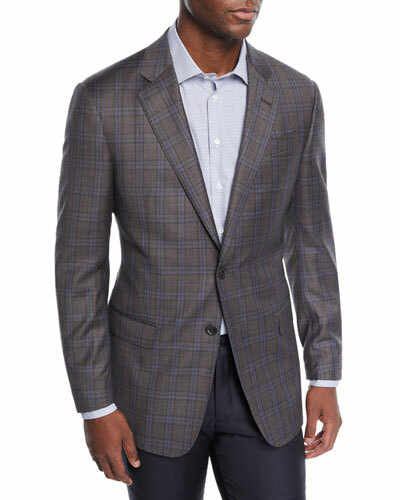 More Details Emporio Armani Two-Tone Plaid Wool Soft Jacket Details Emporio Armani jacket in two-tone plaid. Notched collar; two-button front. Four-button sleeve finish. Chest welt pocket. Besom pockets at hips. Double back vent. Cutaway hem. Virgin wool. Imported. Emporio Armani Two-Tone Plaid Wool Soft Jacket Details Emporio Armani jacket in two-tone plaid. Notched collar; two-button front. Four-button sleeve finish. Chest welt pocket. Besom pockets at hips. Double back vent. Cutaway hem. Virgin wool. Imported. 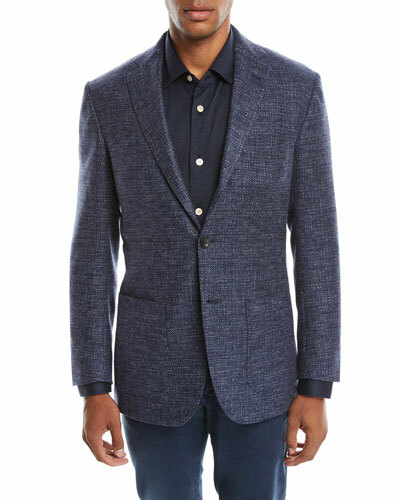 More Details Kiton Men's Tic Cashmere Two-Button Jacket Details EXCLUSIVELY AT NEIMAN MARCUS Kiton jacket in tic textured weave. Notched lapel; two-button front. Basted sleeves. Front patch pockets; chest welt pocket. Double-vented back. Cashmere. Made in Italy. 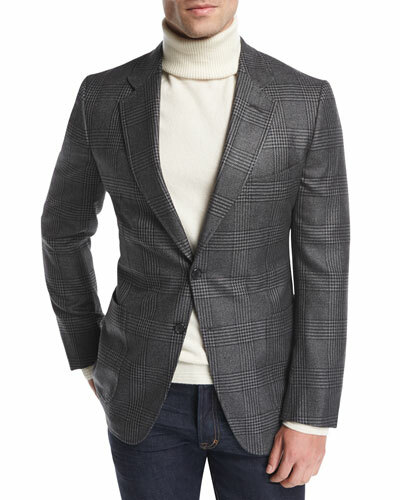 Kiton Men's Tic Cashmere Two-Button Jacket Details EXCLUSIVELY AT NEIMAN MARCUS Kiton jacket in tic textured weave. Notched lapel; two-button front. Basted sleeves. Front patch pockets; chest welt pocket. Double-vented back. Cashmere. Made in Italy. More Details TOM FORD Shelton Prince of Wales Canvas Cardigan Jacket Details EXCLUSIVELY AT NEIMAN MARCUS TOM FORD "Shelton" base cardigan jacket in Prince of Wales plaid canvas. Notch lapel; hand-finished double-stitched silk button hole. Two-button front with hand-stitched buttons. Front patch pockets; hand-cut chest welt pocket. Signature Tom Ford details like hand-rolled three-fold hang cord. Tailored fit. Unlined. Wool/alpaca/cashmere. Made in Italy. Suit/Jacket will ship with prepped sleeves and a set of buttons. Please contact your local Neiman Marcus store for proper finishing of your garment. TOM FORD Shelton Prince of Wales Canvas Cardigan Jacket Details EXCLUSIVELY AT NEIMAN MARCUS TOM FORD "Shelton" base cardigan jacket in Prince of Wales plaid canvas. Notch lapel; hand-finished double-stitched silk button hole. Two-button front with hand-stitched buttons. Front patch pockets; hand-cut chest welt pocket. Signature Tom Ford details like hand-rolled three-fold hang cord. Tailored fit. Unlined. Wool/alpaca/cashmere. Made in Italy. Suit/Jacket will ship with prepped sleeves and a set of buttons. Please contact your local Neiman Marcus store for proper finishing of your garment. More Details TOM FORD Men's O'Connor Wool-Silk Prince of Wales Plaid Blazer Jacket Details TOM FORD "O'Connor" blazer jacket in Prince of Wales plaid. Peaked lapel; hand-finished, double-stitched silk button hole. Two-button front with horn buttons. Front patch pockets; hand-cut chest welt pocket. Double vented back. Signature TOM FORD details like hand-rolled threefold hang cord and exclusive blend lining. Wool/silk. Made in Italy. TOM FORD Men's O'Connor Wool-Silk Prince of Wales Plaid Blazer Jacket Details TOM FORD "O'Connor" blazer jacket in Prince of Wales plaid. Peaked lapel; hand-finished, double-stitched silk button hole. Two-button front with horn buttons. Front patch pockets; hand-cut chest welt pocket. Double vented back. Signature TOM FORD details like hand-rolled threefold hang cord and exclusive blend lining. Wool/silk. Made in Italy. More Details TOM FORD Hopsack Textured Cardigan Jacket, Black Details TOM FORD cardigan jacket in textured hopsack. Notch lapel; hand-finished, double-stitched silk button hole. Two-button front with hand-stitched authentic horn buttons. Front patch pockets; hand-cut chest welt pocket. Center back vent. Signature TOM FORD details like hand-rolled three-fold hang cord attached with four bar tacks. Half-lined with exclusive TOM FORD blend. Wool/silk/mohair. Made in Italy. TOM FORD Hopsack Textured Cardigan Jacket, Black Details TOM FORD cardigan jacket in textured hopsack. Notch lapel; hand-finished, double-stitched silk button hole. Two-button front with hand-stitched authentic horn buttons. Front patch pockets; hand-cut chest welt pocket. Center back vent. Signature TOM FORD details like hand-rolled three-fold hang cord attached with four bar tacks. Half-lined with exclusive TOM FORD blend. Wool/silk/mohair. Made in Italy. More Details TOM FORD Men's O'Connor Exploded Plaid Wool-Silk Blazer Jacket Details TOM FORD "O'Connor" jacket in exploded plaid wool-blend. Notched lapel; hand-finished, double-stitched silk button hole. Two-button front with horn buttons. Front patch pockets; hand-cut chest welt pocket. Double vented back. Signature TOM FORD details like hand-rolled threefold hang cord and exclusive blend lining. Wool/silk. Made in Italy. TOM FORD Men's O'Connor Exploded Plaid Wool-Silk Blazer Jacket Details TOM FORD "O'Connor" jacket in exploded plaid wool-blend. Notched lapel; hand-finished, double-stitched silk button hole. Two-button front with horn buttons. Front patch pockets; hand-cut chest welt pocket. Double vented back. Signature TOM FORD details like hand-rolled threefold hang cord and exclusive blend lining. Wool/silk. Made in Italy. More Details TOM FORD Men's Shelton Base Cardigan Jacket Details TOM FORD "Shelton" base cardigan jacket. Notched lapel; hand-finished, double-stitched silk button hole. 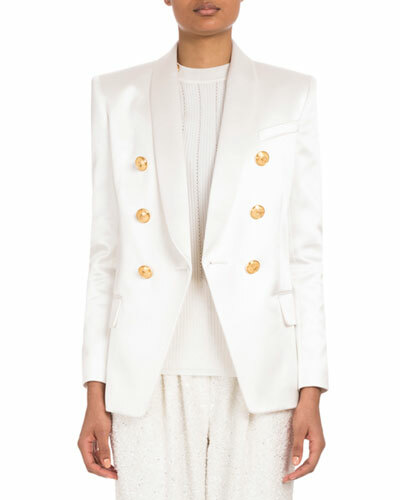 Two-button front with mother-of-pearl buttons. Structured shoulders; five-button detail at cuffs. Front patch pockets; hand-cut and -stitched chest welt pocket. Single-vented back. Fully lined. Signature TOM FORD details like hand-rolled three-fold hand cord and exclusive blend lining. Cashmere. Made in Italy. TOM FORD Men's Shelton Base Cardigan Jacket Details TOM FORD "Shelton" base cardigan jacket. Notched lapel; hand-finished, double-stitched silk button hole. Two-button front with mother-of-pearl buttons. Structured shoulders; five-button detail at cuffs. Front patch pockets; hand-cut and -stitched chest welt pocket. Single-vented back. Fully lined. Signature TOM FORD details like hand-rolled three-fold hand cord and exclusive blend lining. Cashmere. Made in Italy. 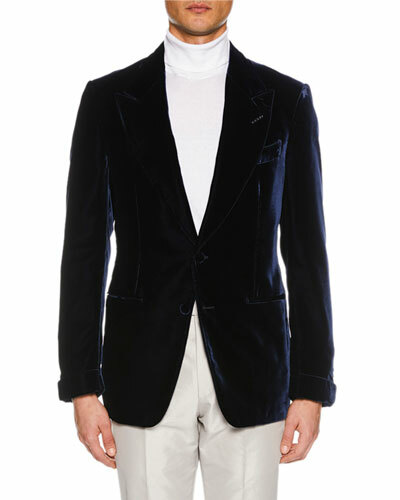 More Details TOM FORD Men's Shelton Brushed Cashmere Cardigan Jacket Details TOM FORD "Shelton" base cardigan jacket. Notched lapel; hand-finished, double-stitched silk button hole. Two-button front with mother-of-pearl buttons. Structured shoulders; five-button detail at cuffs. Front patch pockets; hand-cut and -stitched chest welt pocket. Single-vented back. Fully lined. Signature TOM FORD details like hand-rolled three-fold hand cord and exclusive blend lining. Cashmere. Made in Italy. TOM FORD Men's Shelton Brushed Cashmere Cardigan Jacket Details TOM FORD "Shelton" base cardigan jacket. Notched lapel; hand-finished, double-stitched silk button hole. Two-button front with mother-of-pearl buttons. Structured shoulders; five-button detail at cuffs. Front patch pockets; hand-cut and -stitched chest welt pocket. Single-vented back. Fully lined. Signature TOM FORD details like hand-rolled three-fold hand cord and exclusive blend lining. Cashmere. Made in Italy. More Details TOM FORD O'Connor Textured Wool-Blend Two-Button Jacket Details TOM FORD "O'Connor" jacket in textured weave. Notch lapel; hand-finished, double-stitched silk button hole. Two-button front with hand-stitched buttons. Front patch pockets; hand-cut chest welt pocket. Center back vent. Wool/mohair/mulberry silk. Made in Italy. 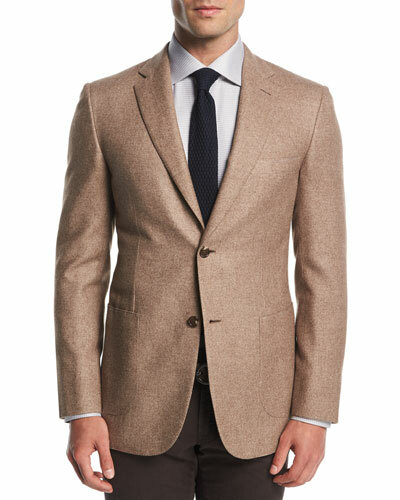 TOM FORD O'Connor Textured Wool-Blend Two-Button Jacket Details TOM FORD "O'Connor" jacket in textured weave. Notch lapel; hand-finished, double-stitched silk button hole. Two-button front with hand-stitched buttons. Front patch pockets; hand-cut chest welt pocket. Center back vent. Wool/mohair/mulberry silk. Made in Italy. 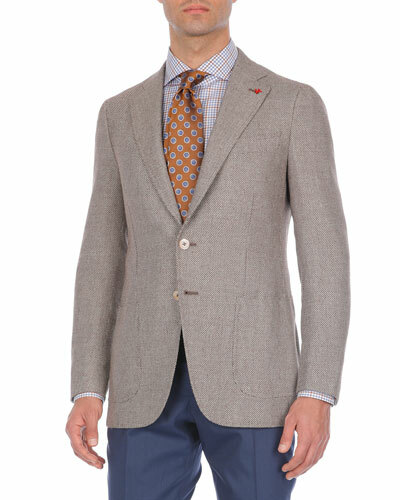 More Details Isaia Windowpane Twill Two-Button Jacket Details Isaia sport coat in windowpane twill. Notched collar; two-button front. Welt pocket at left chest. Flap pockets at hips. Tailored fit. Double back vent. Wool/silk/linen. Made in Italy. 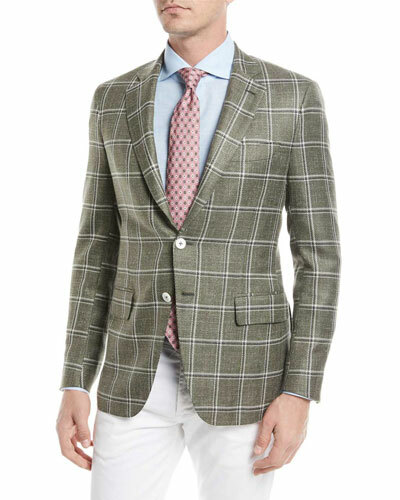 Isaia Windowpane Twill Two-Button Jacket Details Isaia sport coat in windowpane twill. Notched collar; two-button front. Welt pocket at left chest. Flap pockets at hips. Tailored fit. Double back vent. Wool/silk/linen. Made in Italy. 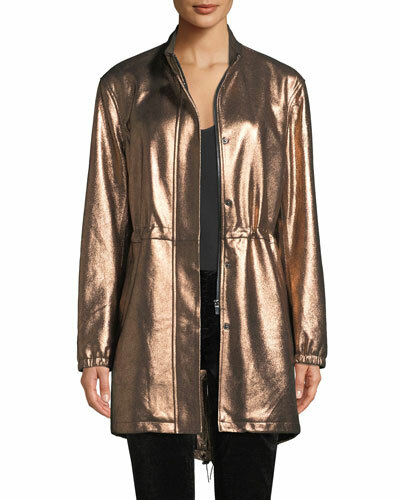 More Details Neiman Marcus Leather Collection Metallic Leather Anorak Jacket Details Neiman Marcus Leather Collection anorak jacket in metallic lamb leather. Stand collar; placket conceals snap/zip front. Long sleeves; elasticized cuffs. Inner drawcord cinches waist. Slanted welt pockets at hip. Drawstring fishtail hem. Imported. Neiman Marcus Leather Collection Metallic Leather Anorak Jacket Details Neiman Marcus Leather Collection anorak jacket in metallic lamb leather. Stand collar; placket conceals snap/zip front. Long sleeves; elasticized cuffs. Inner drawcord cinches waist. Slanted welt pockets at hip. Drawstring fishtail hem. Imported. 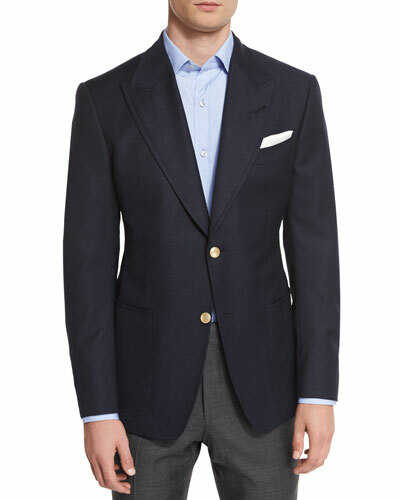 More Details Ermenegildo Zegna One-Button Wool Jacket Details Ermenegildo Zegna blazer in grosgrain weave. Notched lapel; one-button front. Lightly padded shoulder. Basted sleeves. Welt pockets at chest. Flap pockets at sides. Double-vented back. Wool. Made in Italy. Ermenegildo Zegna One-Button Wool Jacket Details Ermenegildo Zegna blazer in grosgrain weave. Notched lapel; one-button front. Lightly padded shoulder. Basted sleeves. Welt pockets at chest. Flap pockets at sides. Double-vented back. Wool. Made in Italy. 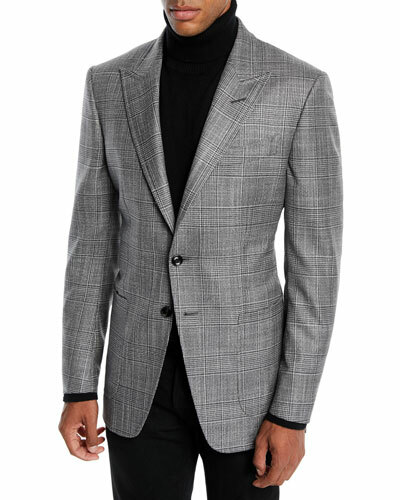 More Details Giorgio Armani Soft Textured Jacket Details Giorgio Armani sport coat in textured stretch blend. Notched lapel; two-button front. Found-button detail at cuffs. Hip and chest welt pockets. Viscose/nylon/cotton/spandex. Made in Italy. 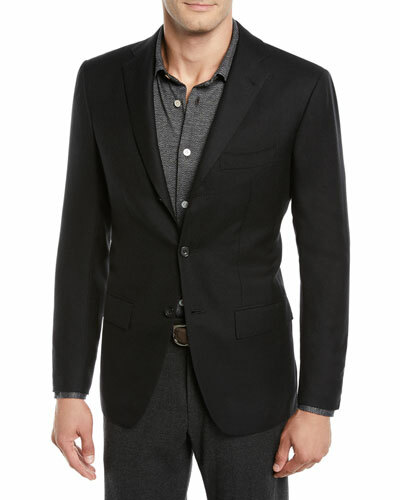 Giorgio Armani Soft Textured Jacket Details Giorgio Armani sport coat in textured stretch blend. Notched lapel; two-button front. Found-button detail at cuffs. Hip and chest welt pockets. Viscose/nylon/cotton/spandex. Made in Italy. 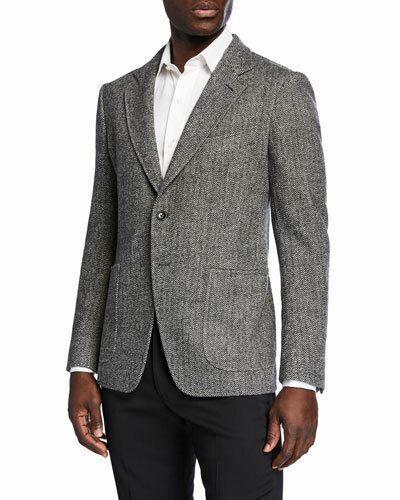 More Details Ermenegildo Zegna Wool Houndstooth Two-Button Jacket Details Ermenegildo Zegna jacket in micro houndstooth. Notched lapel; two-button front. Lightly padded shoulder. Basted sleeves. Welt pockets at chest. Flap pockets at sides. Double-vented back. Wool. Made in Switzerland. Ermenegildo Zegna Wool Houndstooth Two-Button Jacket Details Ermenegildo Zegna jacket in micro houndstooth. Notched lapel; two-button front. Lightly padded shoulder. Basted sleeves. Welt pockets at chest. Flap pockets at sides. Double-vented back. Wool. Made in Switzerland. 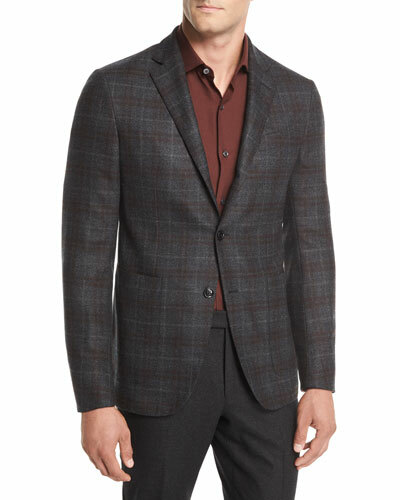 More Details Ermenegildo Zegna Wool Plaid Two-Button Blazer Details EXCLUSIVELY AT NEIMAN MARCUS Ermenegildo Zegna blazer jacket in wool plaid. Notched lapel; two-button front. Basted sleeves. Lightly padded shoulder. Front patch pockets; chest welt pocket. Double vent. Made in Switzerland. 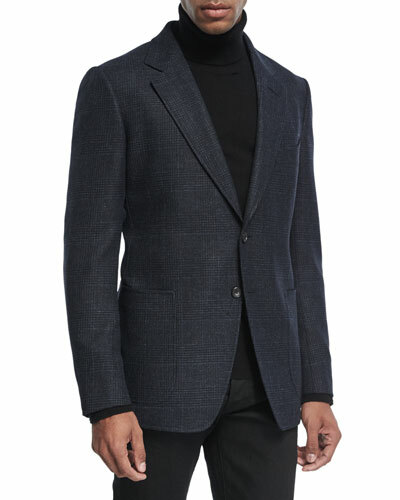 Ermenegildo Zegna Wool Plaid Two-Button Blazer Details EXCLUSIVELY AT NEIMAN MARCUS Ermenegildo Zegna blazer jacket in wool plaid. Notched lapel; two-button front. Basted sleeves. Lightly padded shoulder. Front patch pockets; chest welt pocket. Double vent. Made in Switzerland. 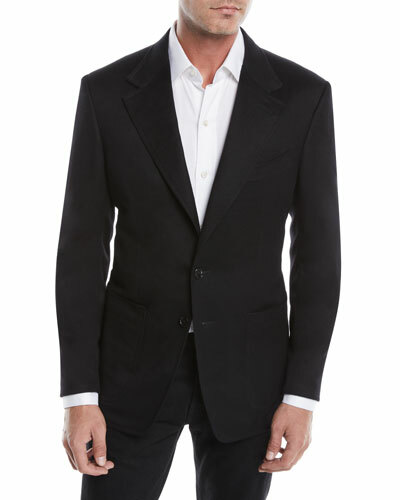 More Details Brioni Melange Silk-Cashmere Two-Button Blazer Details EXCLUSIVELY AT NEIMAN MARCUS Brioni blazer in mélange. Notched lapels; two-button front. Lightly padded shoulder. Welt pocket at chest. Patch pockets at sides. Double-vented back. Silk/cashmere. Handmade in Italy. 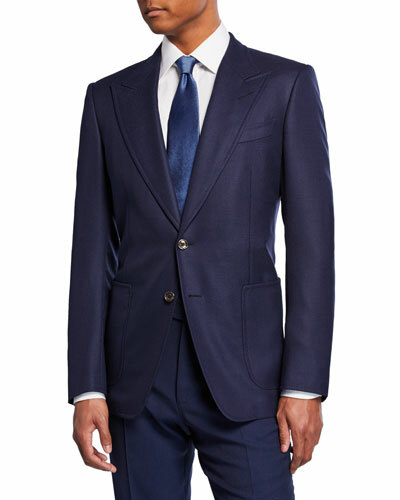 Brioni Melange Silk-Cashmere Two-Button Blazer Details EXCLUSIVELY AT NEIMAN MARCUS Brioni blazer in mélange. Notched lapels; two-button front. Lightly padded shoulder. Welt pocket at chest. Patch pockets at sides. Double-vented back. Silk/cashmere. Handmade in Italy. 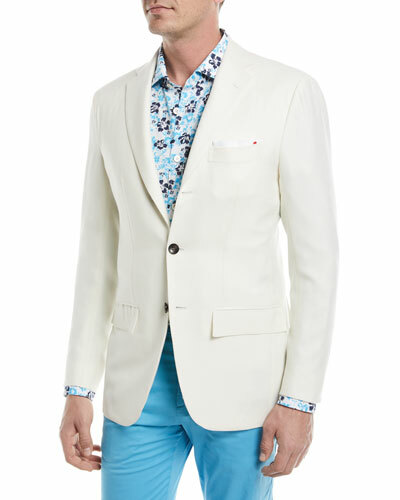 More Details Kiton Cashmere-Silk Three-Button Blazer Details EXCLUSIVELY AT NEIMAN MARCUS Kiton solid blazer/sport coat. Notched lapels; three-button front. Basted sleeves. Chest welt pocket. Flap pockets at hips. Darted front; trim fit. Double-vented back. Cashmere/silk. Made in Italy. 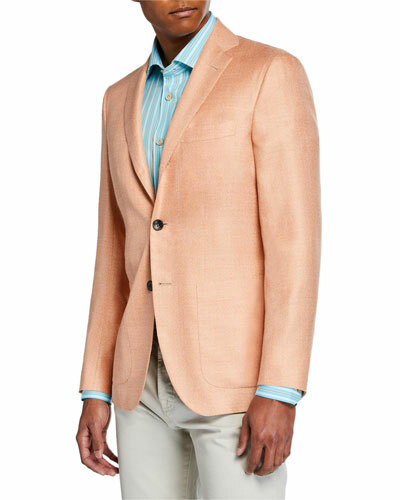 Kiton Cashmere-Silk Three-Button Blazer Details EXCLUSIVELY AT NEIMAN MARCUS Kiton solid blazer/sport coat. Notched lapels; three-button front. Basted sleeves. Chest welt pocket. Flap pockets at hips. Darted front; trim fit. Double-vented back. Cashmere/silk. Made in Italy. 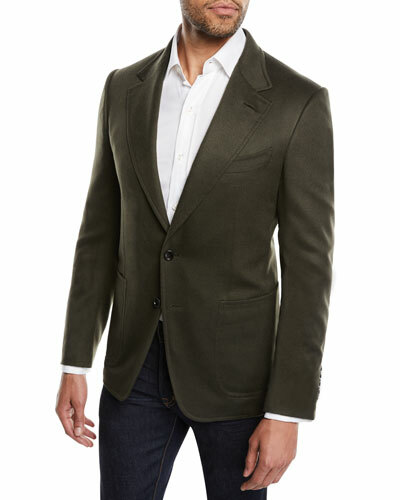 More Details Kiton Men's Solid Cashmere Three-Button Blazer Details EXCLUSIVELY AT NEIMAN MARCUS Kiton blazer in solid sateen weave. Notched lapel; three-button front. Side flap pockets; chest welt pocket. Basted sleeves. Double-vented back. Cashmere/silk. Dry clean. Made in Italy. 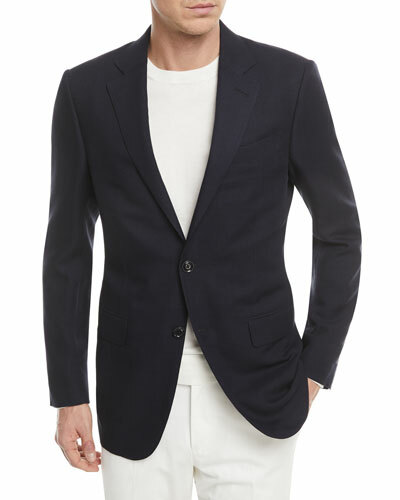 Kiton Men's Solid Cashmere Three-Button Blazer Details EXCLUSIVELY AT NEIMAN MARCUS Kiton blazer in solid sateen weave. Notched lapel; three-button front. Side flap pockets; chest welt pocket. Basted sleeves. Double-vented back. Cashmere/silk. Dry clean. Made in Italy. 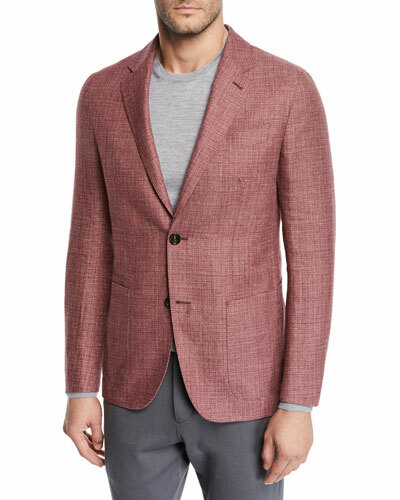 More Details Ermenegildo Zegna Herringbone Cashmere Two-Button Blazer Details EXCLUSIVELY AT NEIMAN MARCUS Ermenegildo Zegna blazer in herringbone cashmere. Notch lapel; two-button front. Basted sleeves. Lightly padded shoulder. Front patch pockets; chest welt pocket. Double vent. Made in Italy. 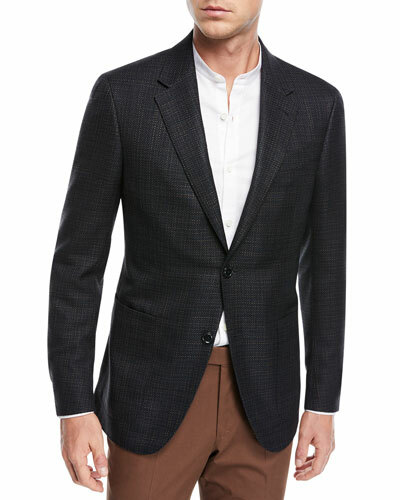 Ermenegildo Zegna Herringbone Cashmere Two-Button Blazer Details EXCLUSIVELY AT NEIMAN MARCUS Ermenegildo Zegna blazer in herringbone cashmere. Notch lapel; two-button front. Basted sleeves. Lightly padded shoulder. Front patch pockets; chest welt pocket. Double vent. Made in Italy. 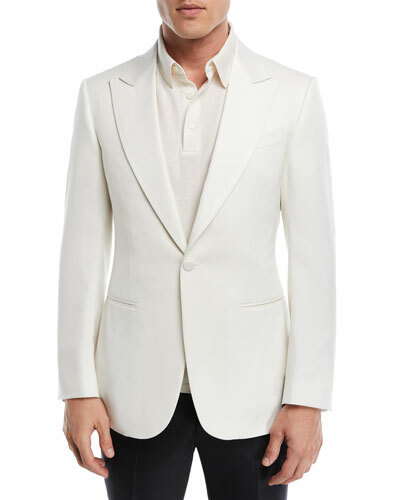 More Details TOM FORD Shelton Peak Patch Two-Button Linen Blazer Details EXCLUSIVELY AT NEIMAN MARCUS TOM FORD jacket in solid linen. Peak lapel; hand-finished, double-stitched silk button hole. Two-button front with hand-stitched buttons. Front patch pockets; hand-cut chest welt pocket. Center back vent. Made in Italy. 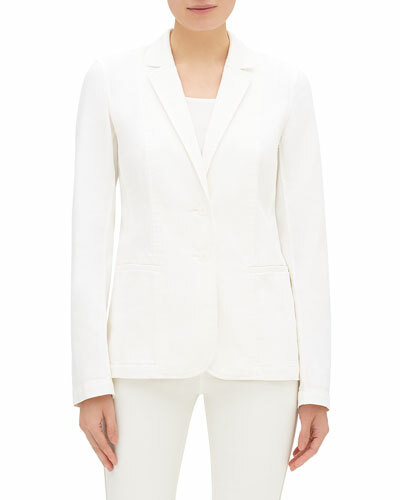 TOM FORD Shelton Peak Patch Two-Button Linen Blazer Details EXCLUSIVELY AT NEIMAN MARCUS TOM FORD jacket in solid linen. Peak lapel; hand-finished, double-stitched silk button hole. Two-button front with hand-stitched buttons. Front patch pockets; hand-cut chest welt pocket. Center back vent. Made in Italy. 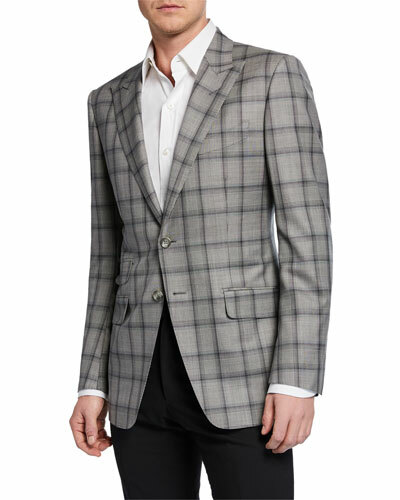 More Details TOM FORD O'Connor 1/2-Lined Plaid Mohair-Linen Blazer Details EXCLUSIVELY AT NEIMAN MARCUS TOM FORD jacket in tonal plaid. Notch lapel; hand-finished, double-stitched silk button hole. Two-button front with hand-stitched buttons. Front patch pockets; hand-cut chest welt pocket. Signature Tom Ford details like hand-rolled three-fold hang cord attached with four bar tacks. Mohair/linen. Made in Italy. 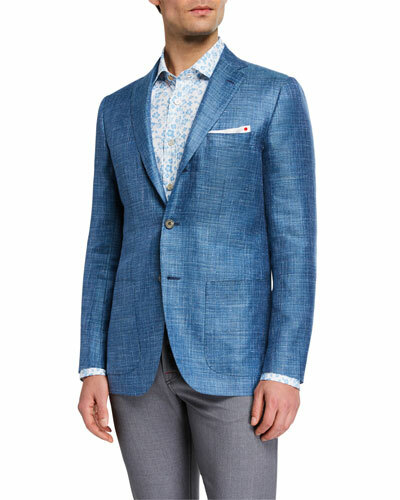 TOM FORD O'Connor 1/2-Lined Plaid Mohair-Linen Blazer Details EXCLUSIVELY AT NEIMAN MARCUS TOM FORD jacket in tonal plaid. Notch lapel; hand-finished, double-stitched silk button hole. Two-button front with hand-stitched buttons. Front patch pockets; hand-cut chest welt pocket. Signature Tom Ford details like hand-rolled three-fold hang cord attached with four bar tacks. Mohair/linen. Made in Italy. 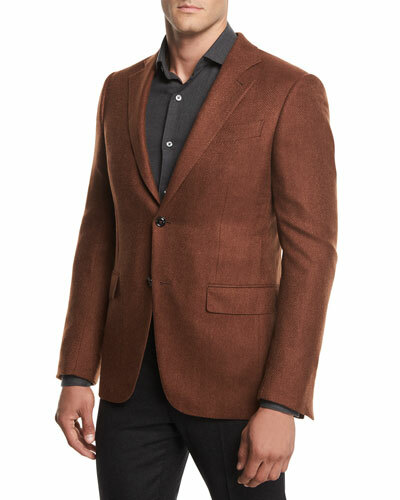 More Details Ermenegildo Zegna Wool Two-Button Blazer, Rust Details EXCLUSIVELY AT NEIMAN MARCUS Ermenegildo Zegna wool blazer. Notch lapel; two-button front. Basted sleeves. Front patch pockets; chest welt pocket. Double-vented back. Made in Italy. 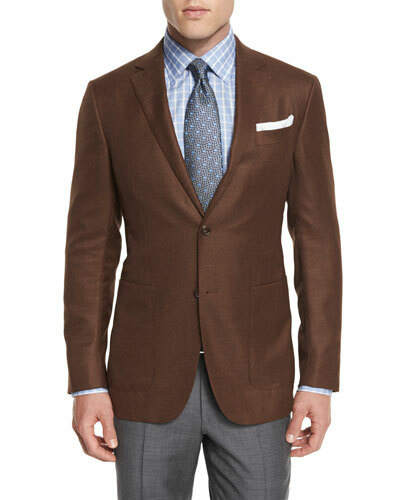 Ermenegildo Zegna Wool Two-Button Blazer, Rust Details EXCLUSIVELY AT NEIMAN MARCUS Ermenegildo Zegna wool blazer. Notch lapel; two-button front. Basted sleeves. Front patch pockets; chest welt pocket. Double-vented back. Made in Italy. 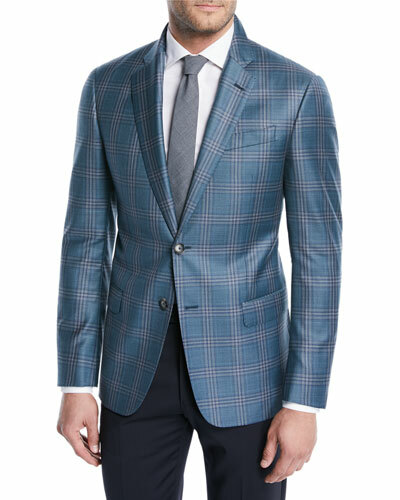 More Details Ermenegildo Zegna Wool Plaid Blazer, Blue Pattern Details EXCLUSIVELY AT NEIMAN MARCUS Ermenegildo Zegna plaid blazer with a natural stretch wool. Notch lapel; two-button front. Four-button detail at cuffs; self elbow patches. Front patch pockets; welt pocket above hip and at chest. Double-vented back. Made in Italy. 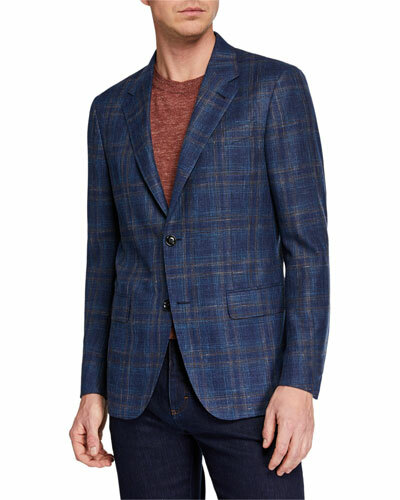 Ermenegildo Zegna Wool Plaid Blazer, Blue Pattern Details EXCLUSIVELY AT NEIMAN MARCUS Ermenegildo Zegna plaid blazer with a natural stretch wool. Notch lapel; two-button front. Four-button detail at cuffs; self elbow patches. Front patch pockets; welt pocket above hip and at chest. Double-vented back. Made in Italy. 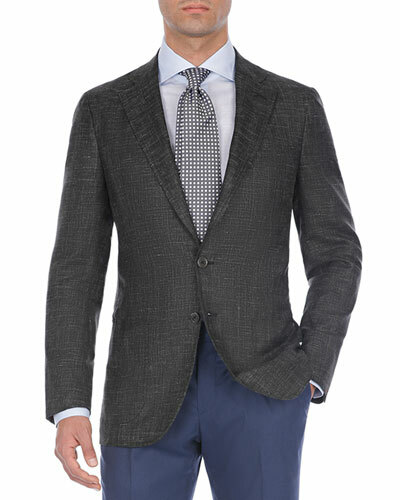 More Details Kiton Men's Cashmere/Silk Houndstooth Blazer Details EXCLUSIVELY AT NEIMAN MARCUS Kiton jacket in two-tone houndstooth. Notched lapel; two-button front. Side patch pockets; chest welt pocket. Basted sleeves. Double-vented back. Cashmere/silk. Dry clean. Made in Italy. 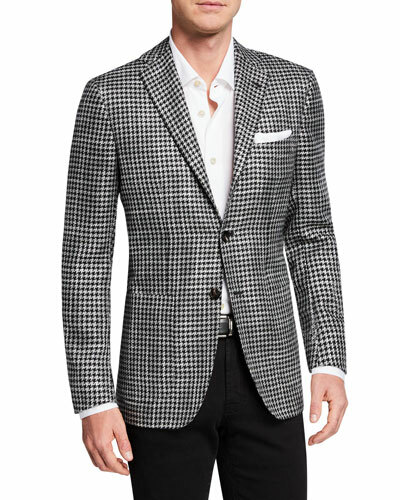 Kiton Men's Cashmere/Silk Houndstooth Blazer Details EXCLUSIVELY AT NEIMAN MARCUS Kiton jacket in two-tone houndstooth. Notched lapel; two-button front. Side patch pockets; chest welt pocket. Basted sleeves. Double-vented back. Cashmere/silk. Dry clean. Made in Italy. 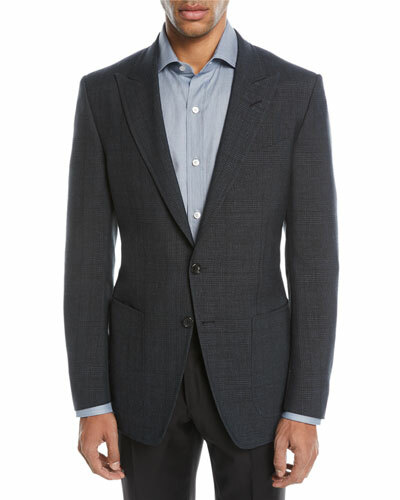 More Details Ermenegildo Zegna Men's Wool/Linen Tic Blazer Details EXCLUSIVELY AT NEIMAN MARCUS Ermenegildo Zegna tic woven blazer jacket. Notched lapel; two-button front. Finished sleeves. Side patch pockets; chest welt pocket. Waist darts. Double-vented back. Wool/linen/silk. Dry clean. Made in Switzerland. 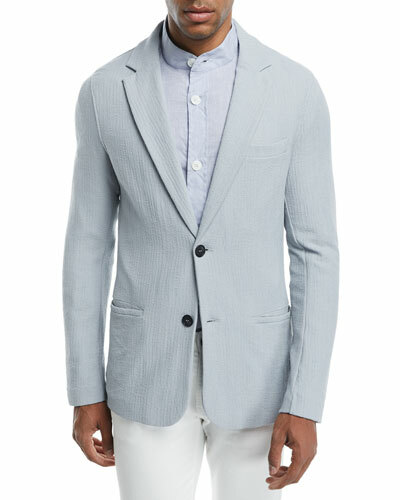 Ermenegildo Zegna Men's Wool/Linen Tic Blazer Details EXCLUSIVELY AT NEIMAN MARCUS Ermenegildo Zegna tic woven blazer jacket. Notched lapel; two-button front. Finished sleeves. Side patch pockets; chest welt pocket. Waist darts. Double-vented back. Wool/linen/silk. Dry clean. Made in Switzerland.